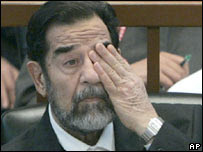 ** The EU, Amnesty international, Human Rights Watch and Ramsey Clark are upset with the Saddam death sentence upheld today. Saddam Defense Attorney Ramsey Clark spoke out today against the court’s decision to go ahead with the execution of “calm, dignified [and] thoughtful” Saddam Hussein within 30 days. An Iraqi appeals court has upheld the death sentence against ousted leader Saddam Hussein for the 1982 killings of 148 Shi’ite villagers. The head of the court, Aref Shahin, announced Tuesday that under Iraqi law, the death sentence is to be carried out within 30 days. A defense lawyer for Saddam, former U.S. Attorney General Ramsey Clark, condemned the decision, saying the trial was unfair. Last month, an Iraqi court sentenced Saddam to hang for the killings of Shi’ites from the town of Dujail after an attempt there to assassinate Saddam. The appeals court also upheld the death sentences for Saddam’s half-brother, Barzan Ibrahim al-Tikriti, and a former judge, Awad al-Bandar, in the Dujail killings. The appellate judges asked the lower court to reconsider the life sentence for former vice president Taha Yassin Ramadan. The appellate court said he should be executed too. The death sentence could be carried out any day now. Human Rights Watch and Amnesty International are also very upset with today’s news. The EU is also urging Iraqis not to carry out the sentence. They all must have missed these articles of evidence.